"Is there anything you've done that would make someone come after you?" IFC Midnight has debuted the official trailer for a Hitchcockian thriller titled Midnighters, the feature directorial debut of editor Julius Ramsay (of work on shows like "The Walking Dead", "Battlestar Galactica", "Flashforward"). 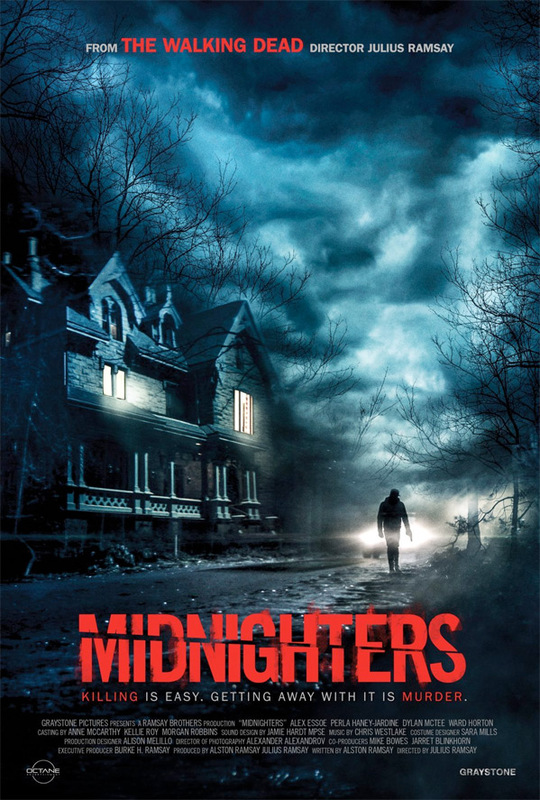 Midnighters is about a couple in a strained marriage who face the ultimate test after they cover up a terrible crime and find themselves entangled in a Hitchcockian web of deceit and madness on New Year's Eve. The film stars Alex Essoe and Dylan McTee, along with Perla Haney-Jardine, Ward Horton, Andrew Rothenberg, and Joseph Anderson. This looks a bit odd, but it might be creepy & thrilling. The film "offers a layered, enigmatic thriller set in the Gothic backwoods of New England – the perfect place to get away with murder." A New Year's night becomes a long day's journey into dread for one unlucky couple. Midnight, New Year's Eve: when all the hopes of new beginnings come to life - except for Lindsey (Alex Essoe) and Jeff Pittman (Dylan McTee), whose strained marriage faces the ultimate test after they cover up a terrible crime and find themselves entangled in a Hitchcockian web of deceit and madness. Midnighters is directed by first-time American filmmaker Julius Ramsay, a veteran editor for "The Walking Dead" and other TV shows now making his feature directorial debut. The screenplay is written by Alston Ramsay. This first premiered at the Los Angeles Film Festival last summer. IFC Midnight will be releasing Julius Ramsay's Midnighters in select theaters + on VOD starting March 2nd, 2018 coming up. Anyone interested in catching this film?